Fall is here! You can sort of feel it in the air hereabouts....brisk winds and shorter days. 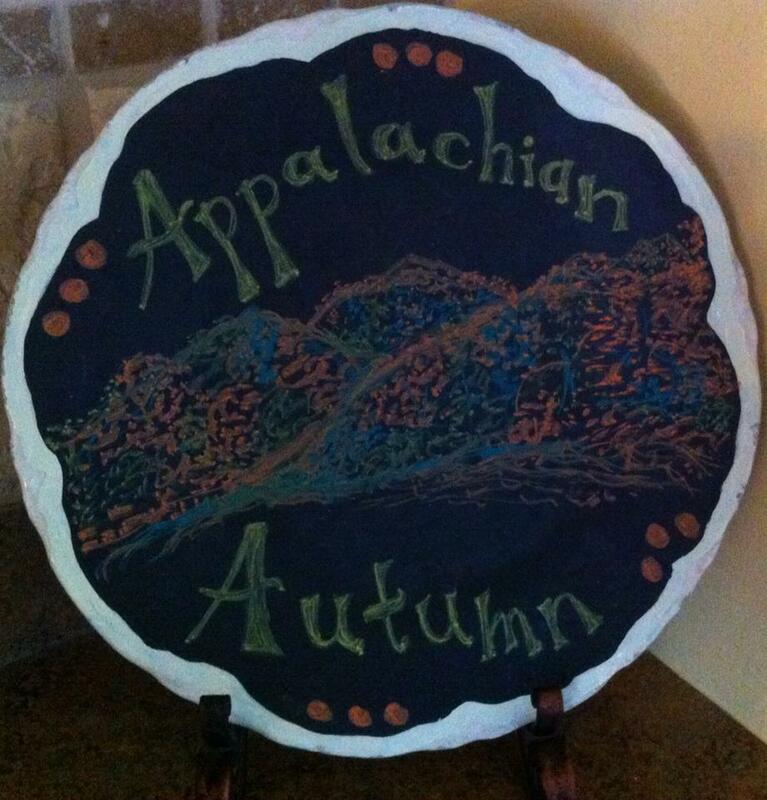 There is something about fall that gets me thinking about gatherings of family and friends. 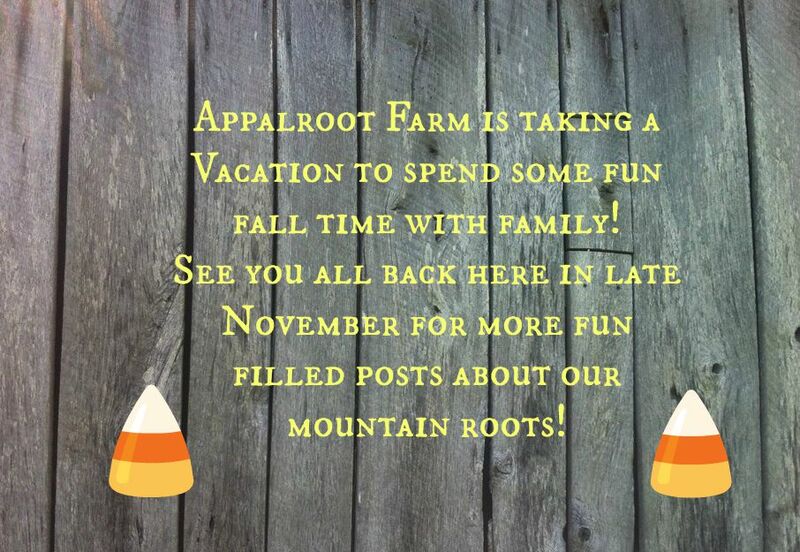 Summer's busyness is over, and the holidays are not terribly far around the corner. Pretty soon there will be celebrations of the season to begin prepping for. So now is a perfect time to start storing away ideas for the inevitable occurrence... "Company's a-comin'!" If, like me, you spent your childhood taking trips back to Appalachia to visit relatives...you may have more early memories of BEING the company, rather than prepping for company! 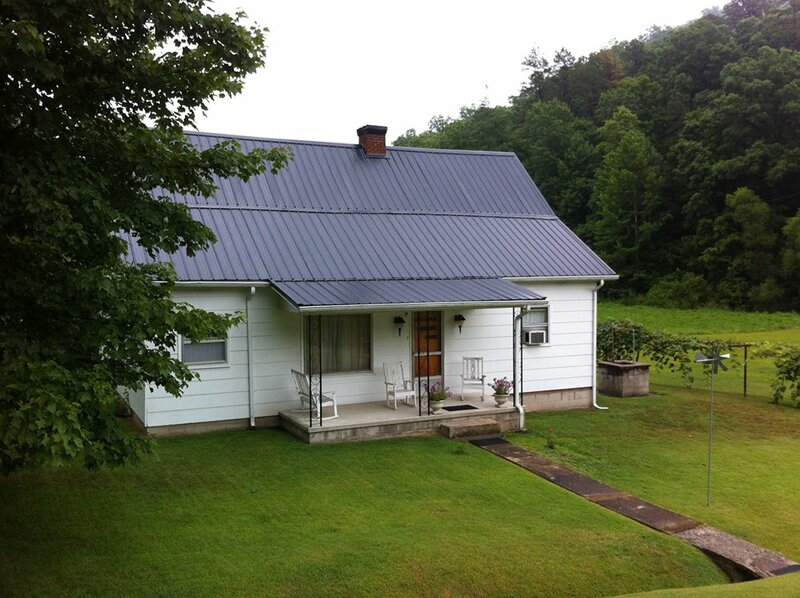 Mamaw's house...the destination for my trips back to Appalachia, and the source of so many sweet memories! I always marveled at the hospitality offered up so selflessly to visitors by my family in the mountains. It has blessed me repeatedly over the years, and taught me multiple lessons in what it means to be truly giving and gracious. And much of that graciousness often turned up in the form of meals: delicious mountain fare prepared by the most loving and skillfully experienced cooks you could imagine. Having eaten my fair share of traditional Appalachian meals in my day (all thanks to those loving and skillfully experienced cooks just mentioned), there is an interesting phenomenon that I have noted through the years. Traditional Appalachian cooks have often possessed a more open minded approach to breakfast than you may find in much of America. Eggs and bacon are great...but somehow or other, a wider variety of "non-breakfast" type foods have held an important place on many a mountain breakfast table through the years. Items the rest of the country would primarily consider suppertime foods, have frequently played a significant role in the first meal of the day in Appalachia. Maybe these foods began showing up on mountain breakfast tables out of necessity, because they were what was available at the time someone needed to serve up the morning meal...but they certainly continued showing up because they make for a downright delicious start to the day! Pork tenderloin is one of my favorite breakfast items from Appalachia that doesn't fit the mold of mainstream breakfast food. Have you tried it for breakfast? 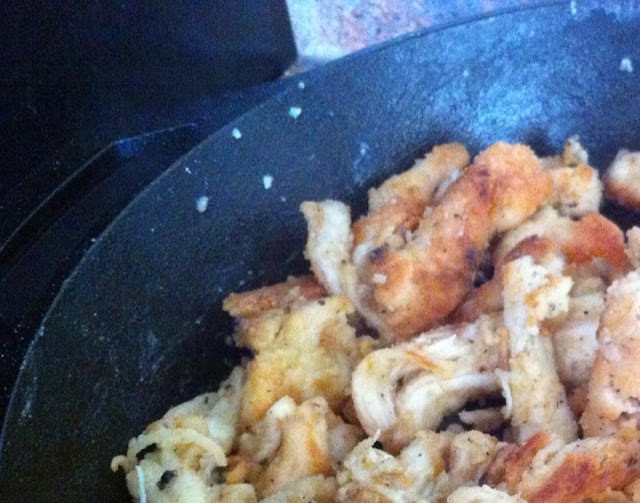 It is amazingly delicious when well seasoned...fried to a golden color in an old iron skillet! I've eaten many a pork tenderloin in my day, served up alongside biscuits and gravy. 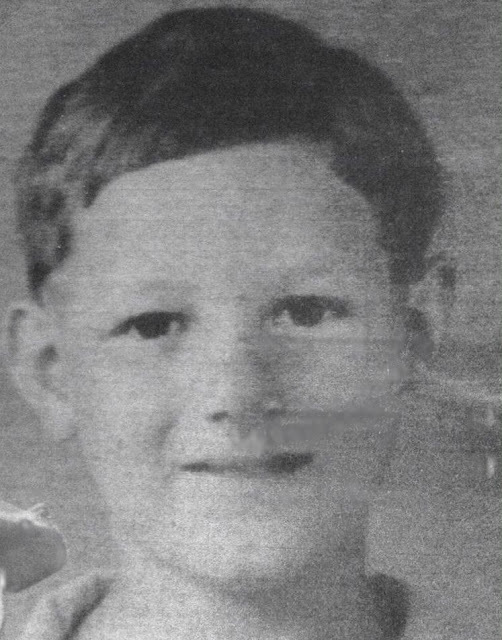 And then there was my papaw...oh my, did he ever love himself a can of Jack Mackerel salmon for breakfast! He'd eat it covered in gravy...and sop up every last morsel of the concoction with biscuits. I never had the nerve to try that myself for breakfast, but Papaw certainly ate that stuff like it was going out of style! Grandad, on my other side, was known for trapping rabbits...and then my granny would fry them up for breakfast, and serve them with a fine rabbit gravy. One time as a kid, my dad remembers he and one of his brothers trying to act real big and going out in the woods in the early morning to check the rabbit trap for my grandad (their father). They got to the location and sure enough found a rabbit in the live trap. Now Grandad would take the rabbit from the trap, knock it in the head, and then carry it on home through the hills as if it was the easiest thing in the world. So my dad and his brother were feeling pretty confident that they could do the same. Well, the second they opened that trap to grab hold of the rabbit...that animal took off like nobody's business. Sure enough, nobody had fried rabbit for breakfast that morning! Then there are the stories I have heard about the legendary goodness of fried chicken breakfasts, served years ago in the mountain community from which my family hails. If a family had company that came and then stayed overnight, it was quite common for the company to arise the next morning to a freshly cut up and fried hen. And obviously, this fried chicken was served with chicken gravy...made from the "post-frying goodness" left over at the bottom of the cast iron skillet that was being utilized to its utmost potential. 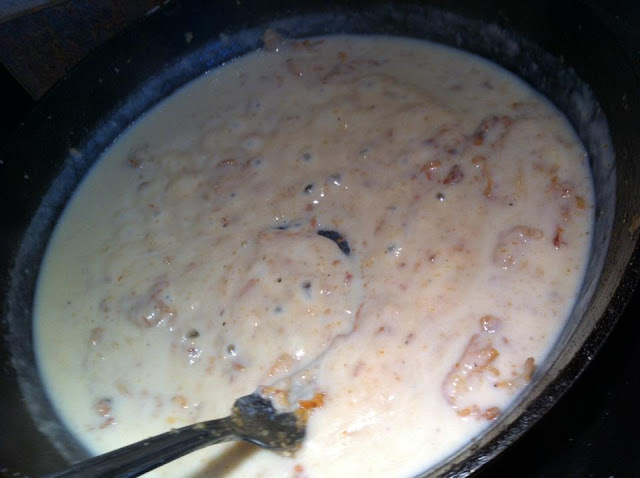 Aunt "Oh So Sweet" herself even swears up and down that fried chicken makes the absolute best breakfast gravy! 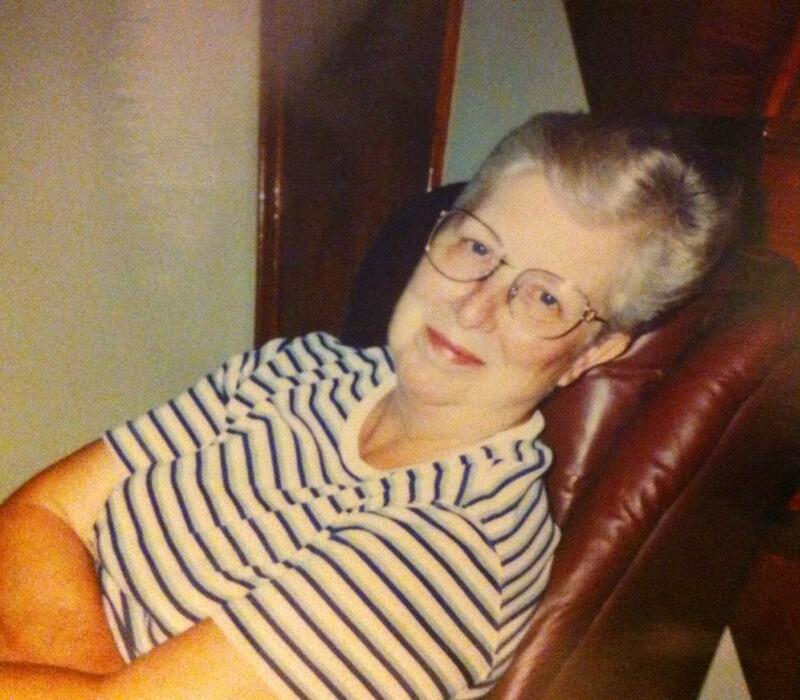 Aunt "Oh So Sweet," who has convinced me of the glories of chicken gravy for breakfast! Mmmmm! The idea of fried chicken for breakfast certainly makes my mouth water. But, I must sadly admit...I don't see myself ever waking up in the morning eager to fry big old raw chicken pieces. Our busy lifestyles today have robbed us of some of the things in life that produce the best results...because we just rarely can afford to take the time needed to get to that end result. But something as great as fried chicken for breakfast is just too wonderful of a mountain tradition to let go by the wayside completely! So I have found an alternative that is very doable for today's busy homes. It may not produce an identical outcome...but it is a delicious imitation, and a great nod of remembrance and honor to that tried and true old Appalachian practice of fried chicken for breakfast time! 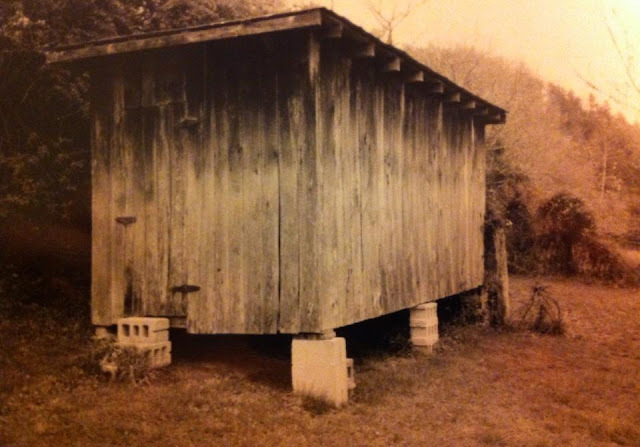 My papaw's old chicken house in Eastern Kentucky...it's been home to many a frying hen in it's day! 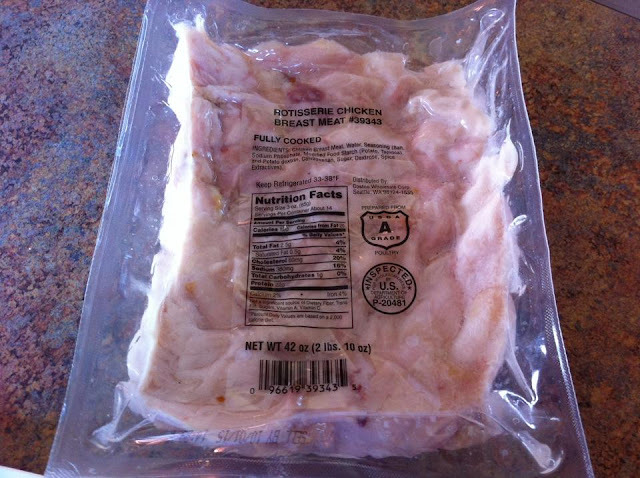 My recipe for Shortcut Fried Chicken, just perfect for breakfast (whether you have company or not), starts out with prepackaged (and precooked), boneless, skinless rotisserie chicken pieces. Now, I know what you are thinking...skinless? 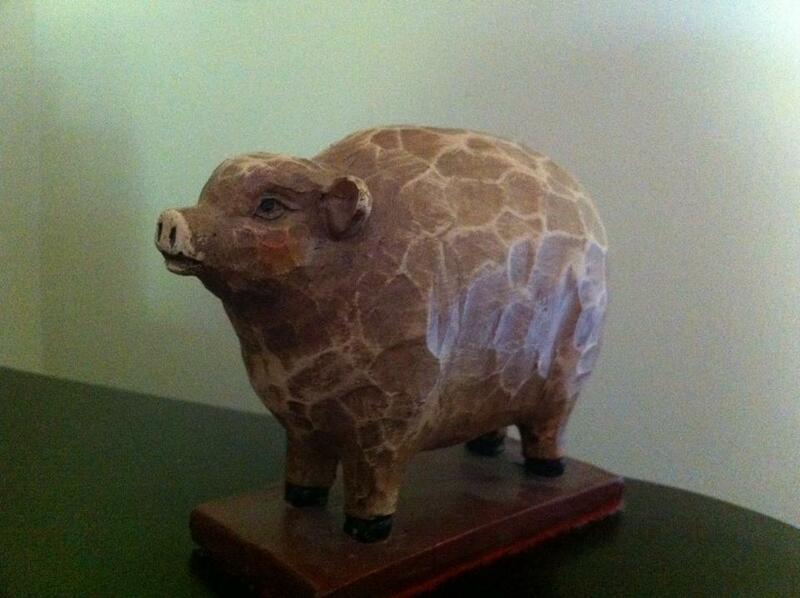 Yes, skinless! I know that the skin of chicken has a great deal of flavor...but we are going for easy here....and this recipe makes fried chicken as easy as can be. And remember, we are using rotisserie chicken...which is generally filled with flavor. So you may miss the skin a little...but this has plenty of great taste, without the extra fat found in chicken skin. You can use the rotisserie chicken of your choice, but if you have a Costco in your area, I highly recommend using Costco's prepacked Rotisserie Chicken Breast Meat. It is what I always use to make my Shortcut Fried Chicken...and it turns out delicious! It comes in a 42 oz. package...so if need be you can make quite the mess of Shortcut Fried Chicken! Now of course, you could always use leftover cooked chicken you have made yourself (and my mother even uses a similar method to perk up leftover Thanksgiving turkey pieces)...but I like how juicy and flavorful the fried rotisserie chicken turns out. It is perfect for breakfast...and pairs wonderfully with homemade biscuits! Use this Costco Warehouse finder to see if there is a location near you. 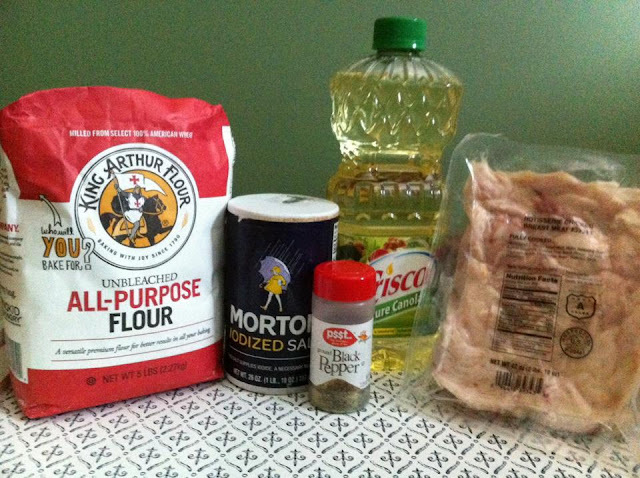 Here is what you will need to make Shortcut Fried Chicken...a recipe just perfect for breakfast. Boneless, skinless rotisserie chicken breast meat pieces, all purpose flour, salt, pepper, onion powder (optional), garlic powder (optional), and oil or fat for frying. 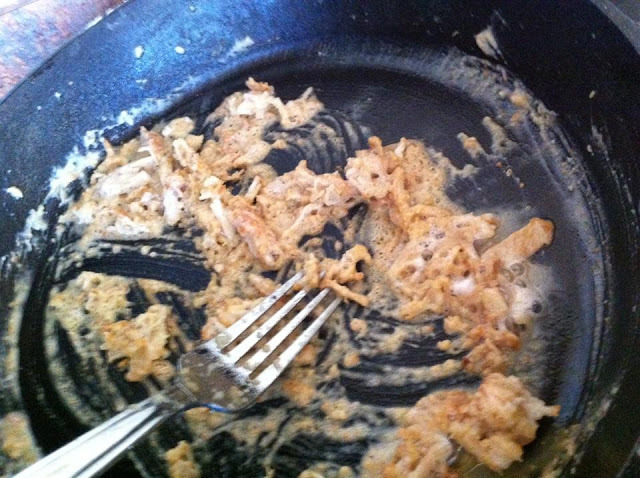 Get a large cast iron skillet (a nonstick pan will work in a pinch...just not as well). I use a number 10 iron skillet for this recipe. Add between three-fourths to one cup of oil, or other fat, to the skillet. 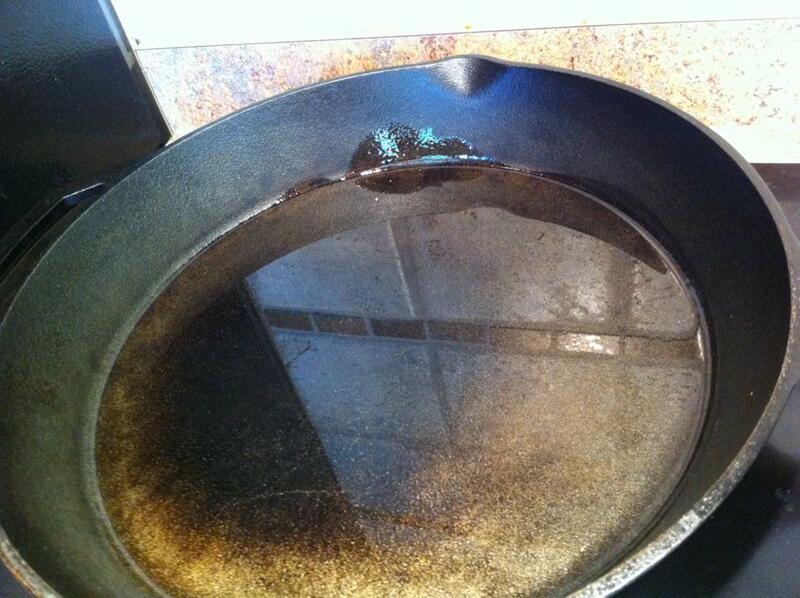 Heat the oil in the skillet on your stove top on medium, until hot. 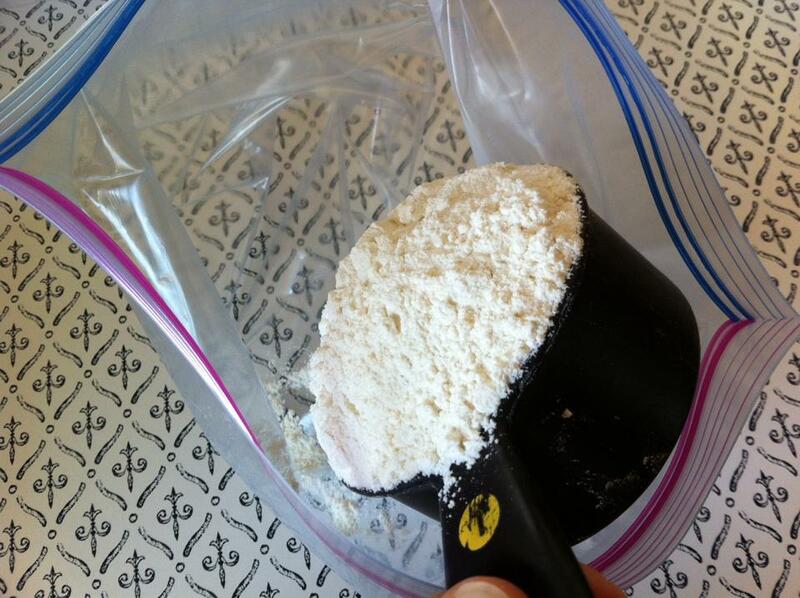 In the meantime, in a gallon size ziplock bag, place one cup of all purpose flour. Add one half teaspoon salt (or to taste). Since rotisserie chicken is already salted, you won't need as much salt as when frying from a fresh hen. Then add about three-fourths teaspoon of ground black pepper, depending on your taste. If desired, add about two teaspoons of onion powder and a half teaspoon of garlic powder. The Costco rotisserie chicken is plenty yummy without these...but if you go with another option, these will help add some flavor to skinless chicken. 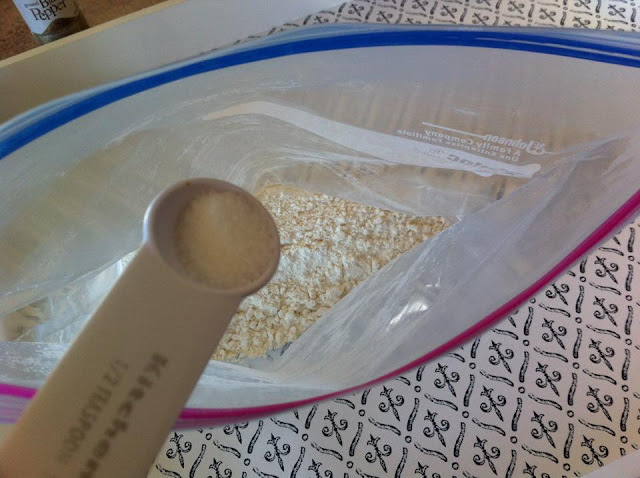 Close and shake the bag to mix the flour and spices. 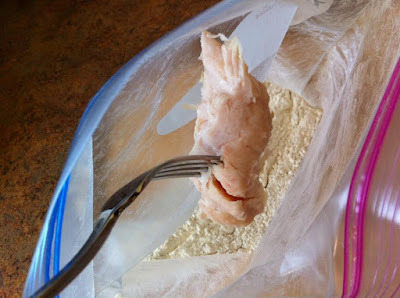 Then add about three-fourths pound of boneless, skinless rotisserie chicken breast pieces to the flour mixture in the bag. The pieces may be all different sizes...and that's okay, because it's all precooked. 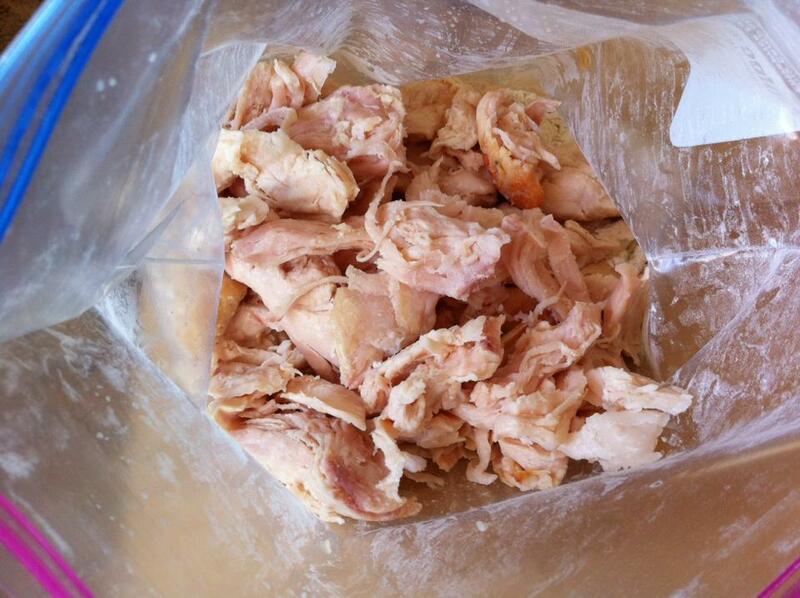 Close the bag and shake well to thoroughly coat the chicken pieces. And yes, I know a ziplock bag would not be what my granny would have used in the process of frying anything...but it sure makes cleanup a cinch! And I think she would have been alright with that. Once your oil is heated, add pieces of coated chicken to the skillet. Cook, turning occasionally, until a nice golden brown. The beauty of it is, your chicken has already been cooked. 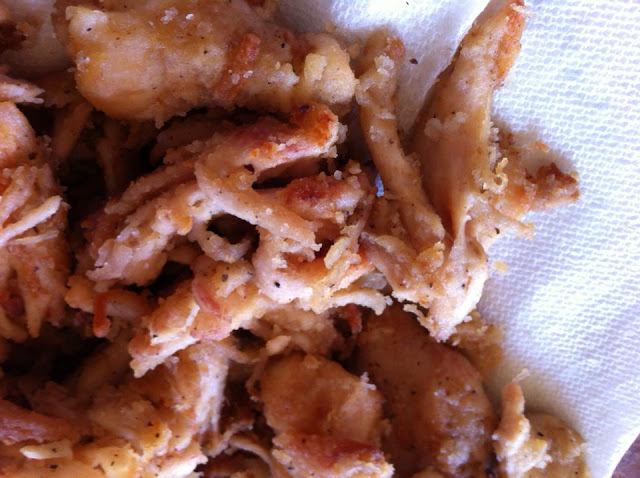 So you can truly get the outside fried up to whatever crispness you desire, with hardly a care at all about what the inside of the chicken pieces look like. It's pretty stress free, which is what makes it a great breakfast option. I might add here, that if you are absolutely dying for some gravy, you can make some to go with your chicken if you have used an iron skillet to fry with. 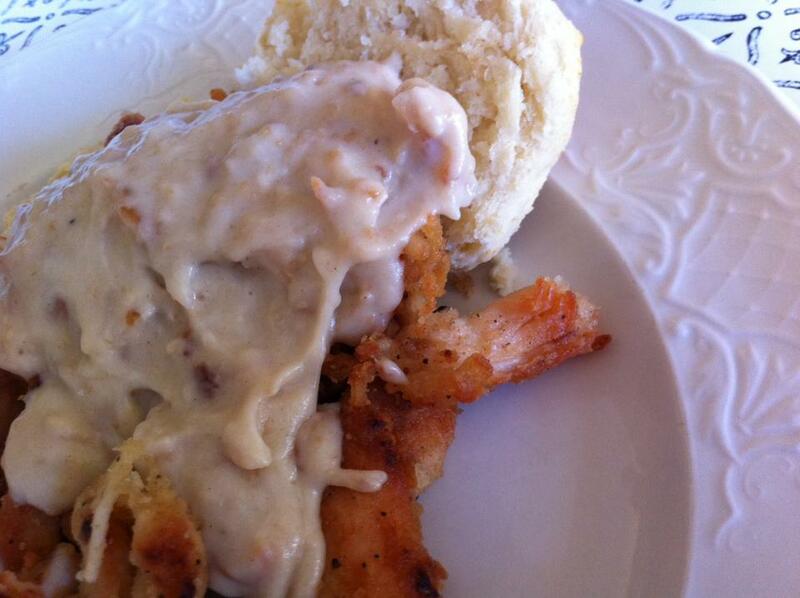 The chicken is great alone...but we all know that a mountain breakfast is just not truly complete without gravy. Now, this gravy will not be anywhere near as good as authentic Appalachian gravy that you have likely been used to (after all, for heaven's sake, we used skinless chicken)...but if you're feeling desperately nostalgic, you can give it a go. To make the gravy, leave all the golden brown bits of fried goodness in your skillet. 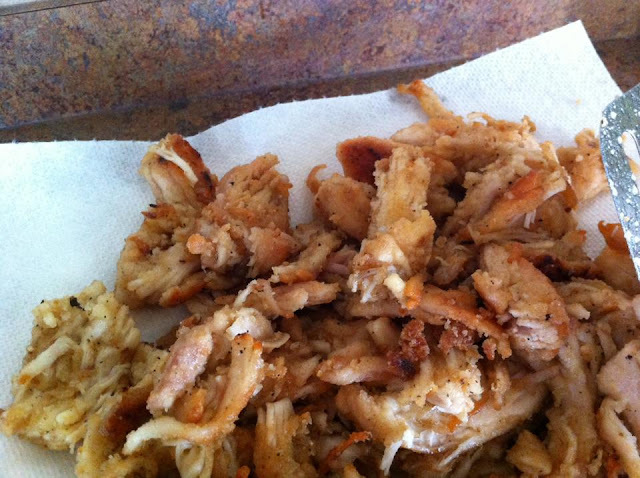 Break apart 3-4 small pieces of the fried chicken and put them back into the skillet for added flavor. If the oil has dried up out of your skillet, add a little more oil or fat until you reach about 4 tablespoons in your skillet, then toss in 4 tablespoons of all purpose flour. (Just try to have approximately even amounts of fat to flour and your gravy should come together well. Heat over medium, stirring constantly until the flour turns a deep, rich golden brown color. The darker you can get it, without burning it...the better your gravy will be. Just brown the dickens out of it if you can! Gradually pour in about two cups of milk. And then add salt and pepper to taste. Stir constantly until desired thickness. It will likely take only a couple minutes to really begin thickening. Serve the gravy with your chicken...and, of course, some good old fashioned biscuits! It might not be your granny's fried chicken, but it's not too shabby either! In all sincerity, though, it is so important to find ways to keep our traditional culture alive in these ever changing and crazy times. If we have the chance to go in the kitchen and fry up a fresh chicken (skin and all) for a special occasion breakfast treat every once in awhile, then we really should. But if we know traditions like that are not going to happen with our hectic lifestyles, finding ways to adapt the traditions to our current circumstances can be so rewarding. After all, I think adapted traditions are better than lost traditions. Our culture is too precious and rich to just allow it to fade. 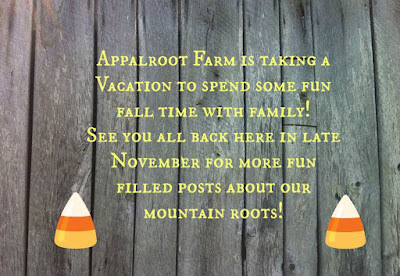 I sure hope this little post has inspired you to try to keep mountain traditions alive and well in your own home, even with today's busyness. Shortcut fried chicken is a great place to start! The recipe is below, and you can click here for a printable version. 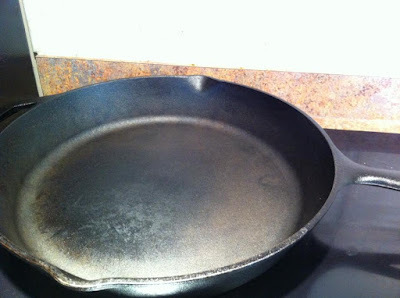 In a large cast iron skillet, heat oil over medium heat on stovetop. In a gallon ziplock bag, place flour, salt, black pepper, and onion and garlic powder if using. Close bag and shake well. Then add chicken pieces to the bag. Shake well to coat. 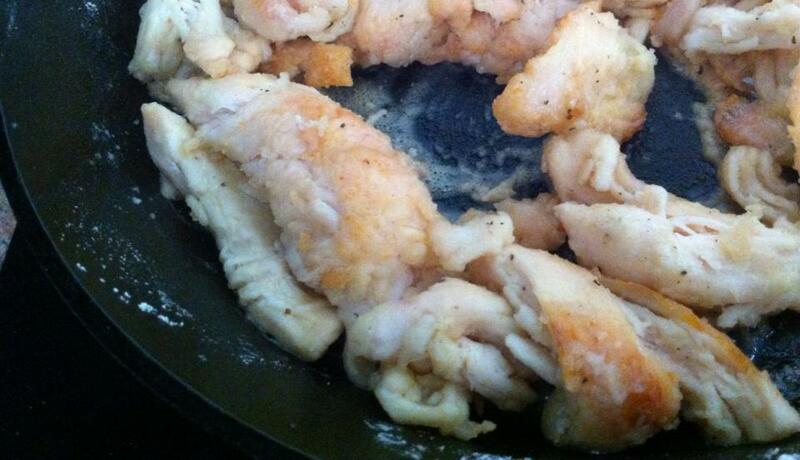 When oil is hot, place chicken pieces in skillet. Cook until golden brown and crisp, turning occasionally. 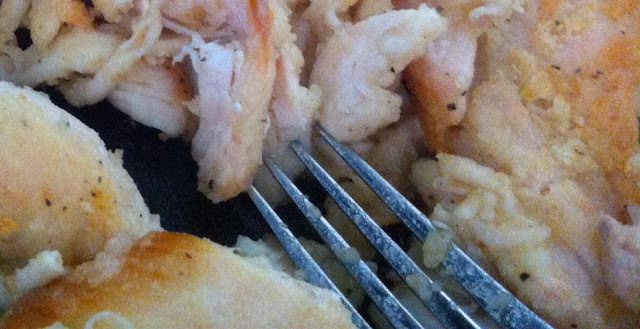 Remove chicken from the skillet, and keep warm until serving. For optional gravy, use remaining pan drippings (add more fat or oil to reach about 4 tbsp. 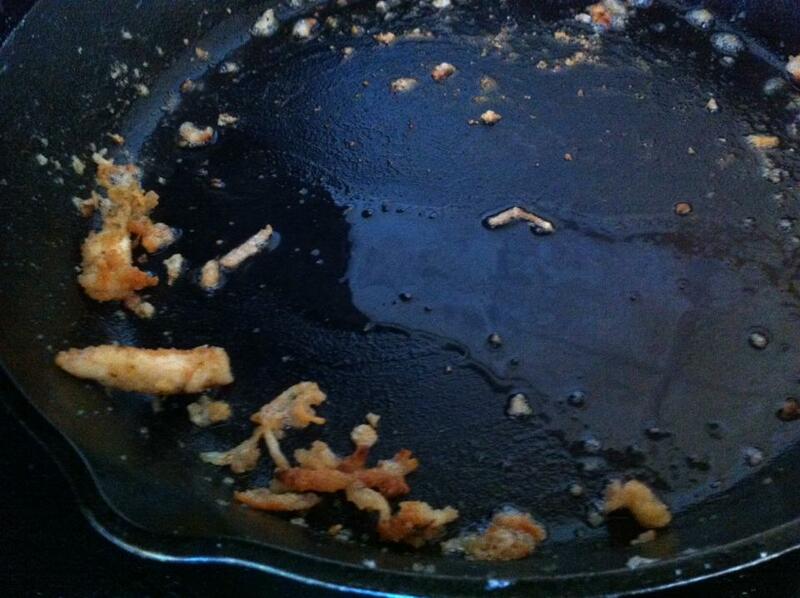 if you do not have enough left in the skillet). 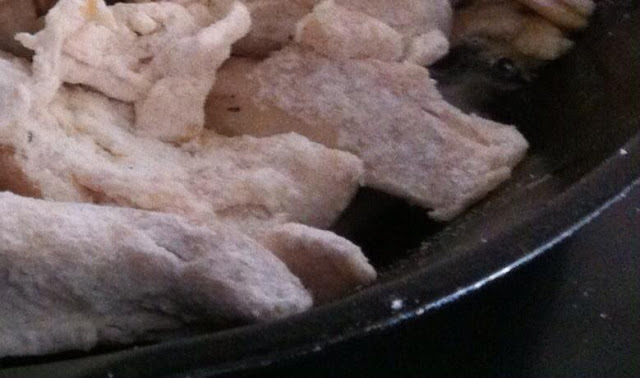 For additional flavor, break apart and add 3-4 of the fried pieces of chicken back into the skillet as well. Next add flour to the drippings in the pan. Heat over medium heat, stirring constantly until the flour mixture becomes a deep brown color. 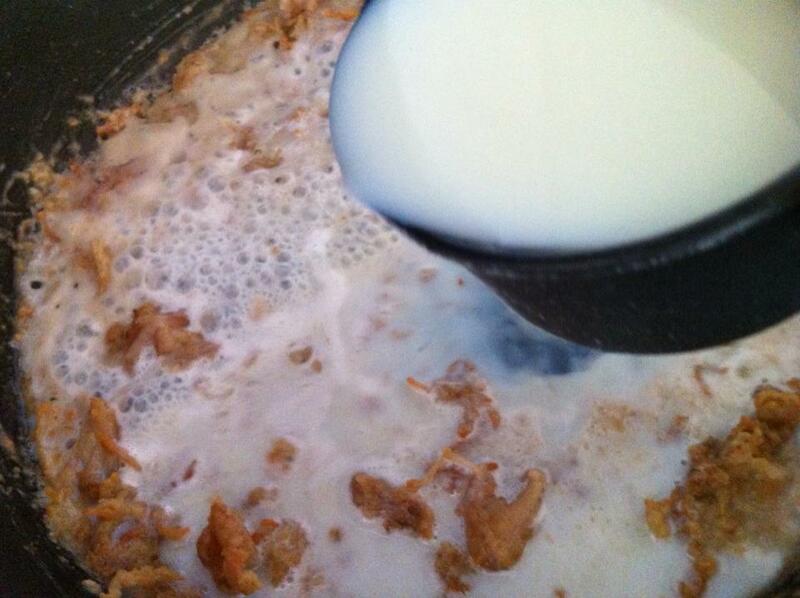 Slowly pour in milk and add the salt and pepper, continuing to stir constantly until the mixture begins to thicken. 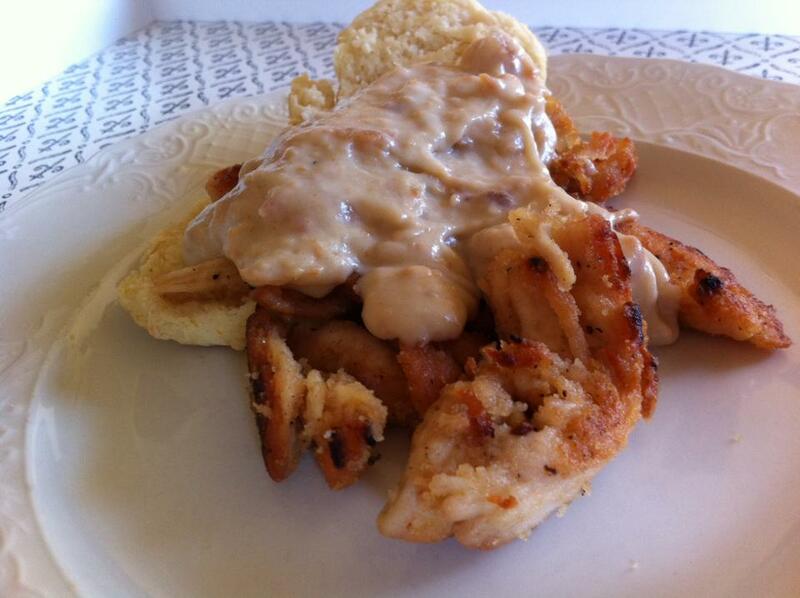 Serve the gravy with chicken. Goes great with biscuits too!